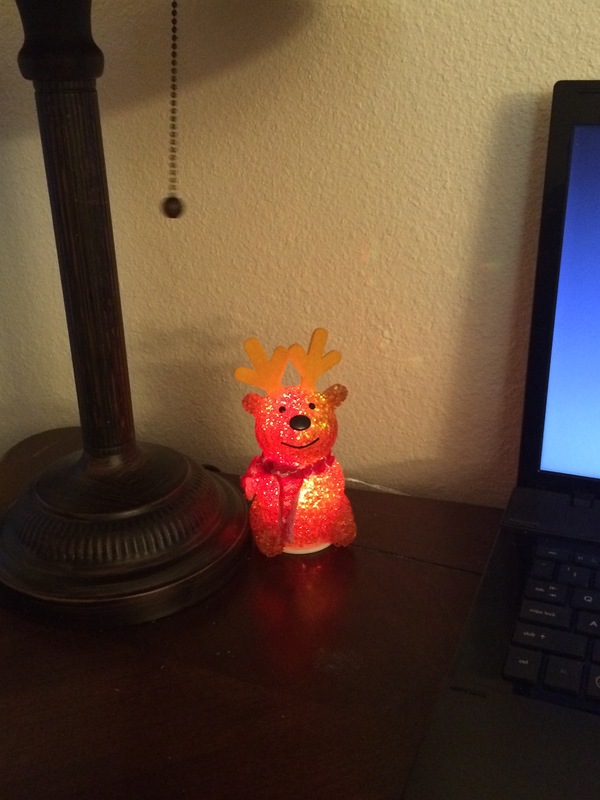 Color changing USB reindeer…When he’s red, he looks a little evil. I’ve never been especially good at it food journaling. Often too excited about cooking (and eating) bacon, I sometimes forget to log it in MyFitnessPal. Add that I hate the idea of filling up email inboxes (and this website) with almost the same content every day, and I might lessen ever so slightly the frequency of these posts. That said, obviously, I’ll still share how I’m doing, but condensing Friday-Sunday into one, combined post keeps me honest enough. As you know, I’ve worked my way through some of Atkins ’72. This book takes me back! Speaking of back (a different kind), the book’s spine has become pretty crumpled, masses of page pieces finding themselves in my hands as I read. Talk about old paperback glue and the ravages of time! Reading the book also alerted me to the uncomfortable fact that I’ve inadvertently been eating an omelet avocado, a little mozzarella (non-aged cheese) and tomato, three distinct no-nos for old school induction. Well, nuts (also not in induction, incidentally). That said, salsa has made its way to my eggs each morning, and those contain tomatoes, also verboten on ’72. Again, NERDS (incidentally, also not Atkins approved). Nasty chicken salad. I think I am taste bud averse to chicken in anything cold. Nasty chicken salad made into goodness by adding 2 tsp heavy white cream, 2 Tbsp grated Parmesan cheese and one slice chopped bacon, baked in the oven for 20 minutes at 350 degrees. I did the hell out of this: Thanks to FitBit, I walked 1 mile without putting much effort into it. 2 slices Papa Murphy’s All-Meat Pizza toppings, no crust. Granted, I know tomato is not 1972 induction friendly, but at no time this week was I in jeopardy of eating over my limit due to tomato, so I’ve allowed myself this one veggie addition, so long as I stuck within my 20 total for the day. I did the hell out of this: Thanks to FitBit, I know I took 1,861 steps and walked .79 miles without putting much effort into it. So what foods in Atkins 72 aren’t around anymore? Good question! D-Zerta is one that pops into my head immediately. There are some defunct brands out there. You can still find the Sugar Twin and the Crazy Mixed up salt, but those are on sites like amazon and not typically found in stores. Oh Wow, I remember D-Zerta! I LOVED that stuff. My mom used to buy it when she was on Atkins. Now I understand why she’d get upset if I got into it! I remember the other things, too. But I never wanted to get into the Crazy Mixed Up Salt. I loved D-Zerta, bless its chemical-tasting little heart. I wrote to Kraft to ask if they ever planned to bring it back, and they said they didn’t.